[CIVIL WAR]. Broadside, “Copperheads Vigorously Prosecuting Peace. Is it the Peace You Want?” c. March 1863. 1 p., 15½ x 23½ in. “Fellow Citizens: They have not a word to say in behalf of the Union, and our own imperiled liberties: But they charge the Administration with the greatest of crimes; and they make solemn declarations of resistance to the execution of Federal Laws. At the end of 1814, Federalists disaffected with the progress of the War of 1812 met in Hartford, Connecticut, to discuss their grievances. Some radicals among them even proposed the secession of New England and a separate peace with Great Britain. Soon after the convention ended, news of General Andrew Jackson’s overwhelming victory at New Orleans and the signing of the Treaty of Ghent made the Hartford Convention seem both irrelevant and unpatriotic. The term “Hartford Convention” became synonymous with disunion and treason. Nearly fifty years later, the Democratic state convention that assembled in Hartford in February 1863 passed resolutions critical of the Lincoln administration and the progress of the war and also called for peace. Republican commentators at the time were quick to draw parallels between the two peace conventions in Hartford. They sought to affix the disgrace of the first Hartford Convention to that of the second, and this broadside illustrates that effort. In addition to nominating leading Peace Democrat Thomas H. Seymour (1807-1868) for governor, the convention adopted a platform that declared “the time has now arrived when all true lovers of the Constitution are ready to abandon the ‘monstrous fallacy’ that the Union can be restored by the armed hand.” They declared that Lincoln’s Emancipation Proclamation “has struck a serious blow at the rights of the States; erected an almost impassable barrier between the North and the South,… and,…ventured upon a system of public policy which, if successfully inaugurated, would disgrace our country in the eyes of the civilized world, and carry lust, rapine, and murder into every household of the slaveholding States.” The convention also criticized the Lincoln administration’s suspension of the writ of habeas corpus (which had also been suspended in the South), declaration of martial law, the dismemberment of the State of Virginia (creation of West Virginia), and other “subversions” of the Constitution. On April 6, 1863, Republican William A. Buckingham (1804-1875) was re-elected as governor of Connecticut, with a majority of 52 percent of the votes, over Thomas H. Seymour, who had served as governor from 1850 to 1853. 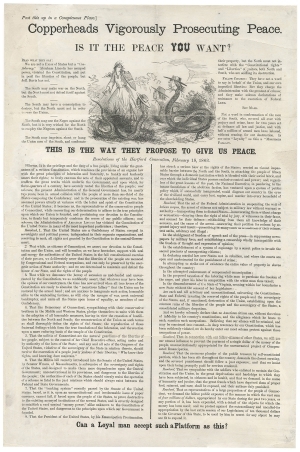 This broadside was likely produced for the 1863 Connecticut gubernatorial campaign but may have also been used later more generally against Peace Democrats. At the August 1864 Democratic national convention in Chicago, the Copperheads gained control of the party platform and inserted planks declaring the war a failure and demanding immediate peace negotiations. If their candidate, General George McClellan, had won, the North would essentially have essentially have sued for peace, recognized the Confederacy, and protected slavery. Relatively small piece loss at margin, restored by professional conservator.